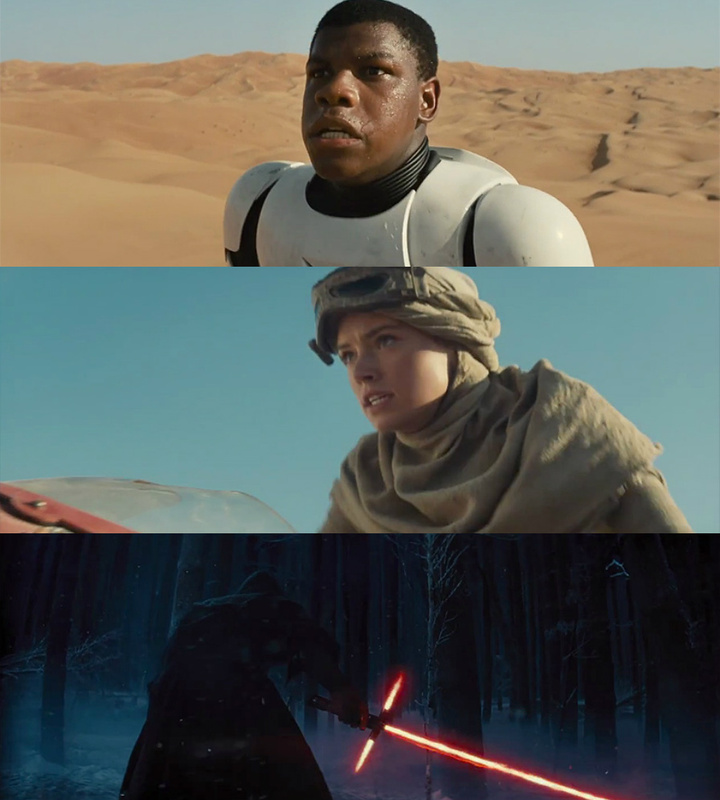 The first teaser trailer for The Star Wars The Force Awakens has hit and the buzz is huge. I’m sure there are people who have analysed it in far more detail than me, but there are a couple of points I have noted. 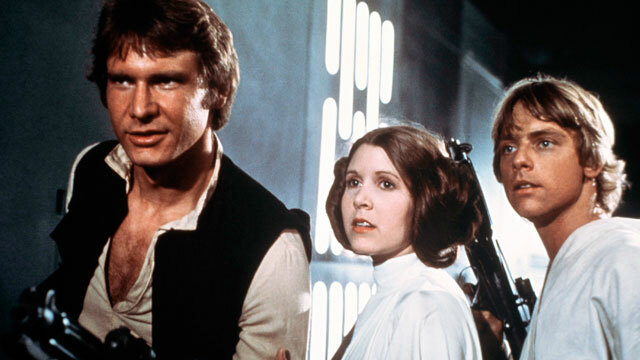 It has been suggested that John Boyega (best known for Attack the Block (2011)) and Daisy Ridley (who has been in a few TV shows) are the Han/Luke and Leia of the story. They both appear to be on Tattooine or a similar “outer rim planet”. The story will surely contrive to throw them together on an adventure. Whatever the plot he is unlikely to remain stormtrooper. Meanwhile on a very different looking planet we see a Sith Lord (red lightsaber!). Endor in winter? Hoth? The Sith is carrying a very different looking lightsaber, longer and with laser hilt, it looks almost like a claymore. This is reminiscent of the moment we first saw Darth Maul’s bo staff/lightsaber in The Phantom Menace. But who is the Sith? The three big names in the cast we don’t see in the trailer are Adam Driver, Andy Serkis and Domhnall Gleeson (Oscar Isaac appears to be piloting an X Wing). The other question, is he the Master or the Apprentice, we know there must be both thanks to Yoda’s explanation. The interesting thing, we don’t see any of the returning original cast. This is a bold but sensible choice. It would be difficult to see them without giving away where they are and what they are doing. But we do have a link to the old movies. We know that the Millennium Falcon was an old ship in the original trilogy, it wouldn’t be out of place to have given it a cameo in one of the prequel trilogy, sadly that didn’t happen, however there are no such worries here. 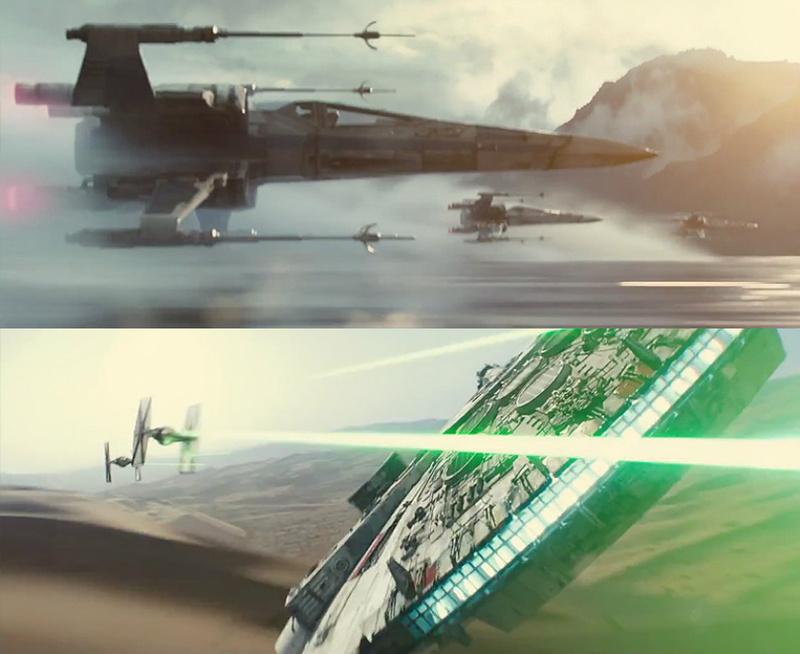 We get to see all the old favourites: the Millennium Falcon, a pair of TIE fighters and a squadron of X-wings. We only have a year to wait! K-Billy’s Super Sounds of the Nineties? 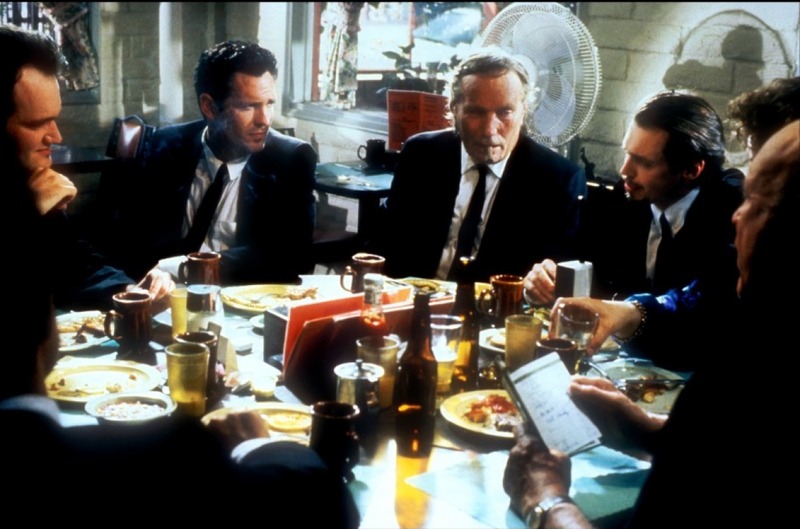 Back in 1992 as a sixteen year old, when I first saw Reservoir Dogs (two years later in 1994 as an eighteen year old to be honest) the 1970’s seemed like a long time ago. Understandable considering I was only four years old when the 70’s gave way to the 80’s. However, now the 90’s don’t seem like that long ago. The characters in the movie talk about the radio station “K-Billy’s Super Sounds of the Seventies” and we hear the station being played in the background. The music fitted perfectly with the contemporary setting film and wasn’t in anyway out of place. 70’s music was commonplace on the radio at the time and still is; in 2009 BBC Radio 2 introduced Johnnie Walkers Sounds of the 70’s, it remains one of the best programs on the radio. There had already been a Sounds of the 60’s for several years and was this year joined by Sounds of the 80’s. 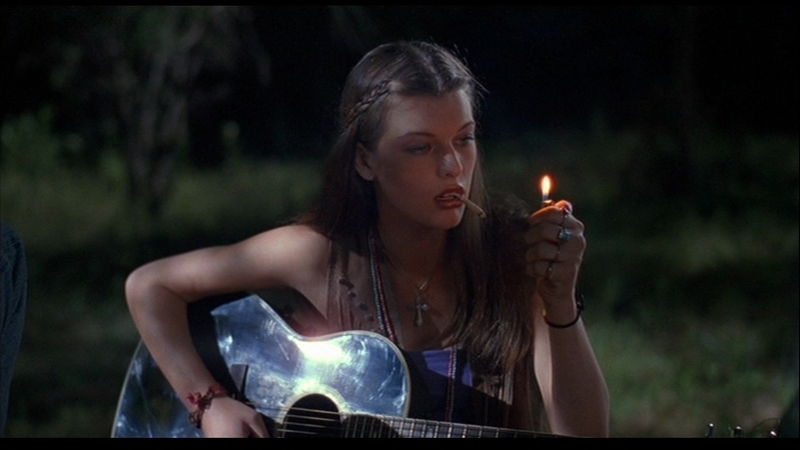 Richard Linklater’s Dazed and Confused (1993) also found its way to British screens in 1994. It took a different approach to 70’s music. By setting the film in 1976 the film was filled with early and mid 70’s classics but portrayed as contemporary music within the films setting. Both these 90s movies were using music from th70’s leading me to wonder if now is the time for a 90’s music revival in film. I’m not sure it is. While the 60’s and 70’s were both looked upon with nostalgia almost as soon as the decades had passed, we have been slow to embraced the 80’s. And while many people are still clinging onto the 90’s as if they had never ended, a new generation doesn’t seem to acknowledge their existence. Growing up in the 80’s, if I believed what I had seen on TV I would have thought the 70’s were made up in equal parts Disco, Punk and Glam Rock. However every type of music you can imagine existed; there was a thriving singer songwriter scene, Country and Southern rock was in its heyday, Heavy Metal and Urban music were in their formative years. This only scratches the surface of 70’s music. The same is true of the 90’s. Britpop and Grunge get all the headlines but we also had the start of Alternative metal. 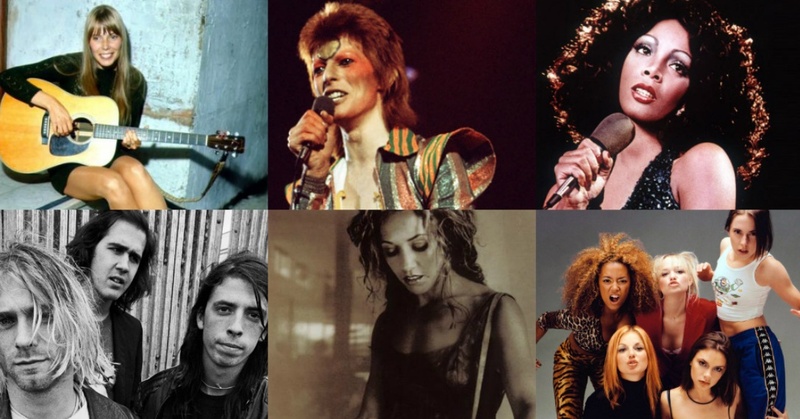 A renaissance for female singer songwriters and Punk Rock. Hip Hop, R&B and Country music began to blur with the mainstream and the decade ended with a resurgence of pop and a Post Grunge Rock planted the seed for today’s Rock. There have already been a few films set in the 90’s. Many of them centering around world events such as the Gulf War, Three Kings (1999) and Jarhead (2005) being the most notable. Characters in the later even made a point of talking about music such as Public Enemy being the music of their war shunning the 60’s and 70’s music from Vietnam War and Vietnam War movies. I am yet to see Spike Island (2012), a film based on The Stone Roses famous outdoor concert in 1990. But this could be the start of things to come. As could the third spin off to This Is England set in 1990 if it ever gets made. It is this type of film featuring everyday people that we haven’t really seen much of yet. The closest thing to Dazed and Confused to be made recently is probably The Perks of Being a Wallflower (2012). The interesting thing about the music in that film though is the way the characters are more interested in a previous generation, Dexys Midnight Runners, David Bowie and The Smiths. Is it possible that in the internet world in which we line, music is too readily available and there are less surprises than there ever has been before. This takes the mystery away from the 90’s in a way that didn’t happen when we looked back from the 90’s to the 70’s. How does this access all areas attitude affect the way the present will be looked back on ion the future? I write this more out of interest than excitement. While I like a lot of 90’s music, I spent the first half of the decade listening to more music from the 60’s, 70’s and 80’s than the 90’s. When I first read the announcement it promised the a movie with a female lead as fans have been demanding. I had to go back to see what I had missed, a Black Widow movie? It appears not. Marvel Studios president Kevin Feige assures us we will be seeing a lot more of Natasha Romanoff / Black Widow (Scarlett Johansson) “Her part in Avengers: Age Of Ultron is very, very big and further develops her character”. But she is not the leading lady in question, that honour goes to Captain Marvel (2018), aka Carol Danvers. I skipped past the 2018 list assuming Captain Marvel was a man. It turns out he was, now she isn’t. Showing my ignorance of the Avengers comic book movies I had to look her/him/them up. It appears the first Captain Marvel, created by Stan Lee and Gene Colan in 1967, was Captain Mar-Vell of the Kree Imperial Militia. 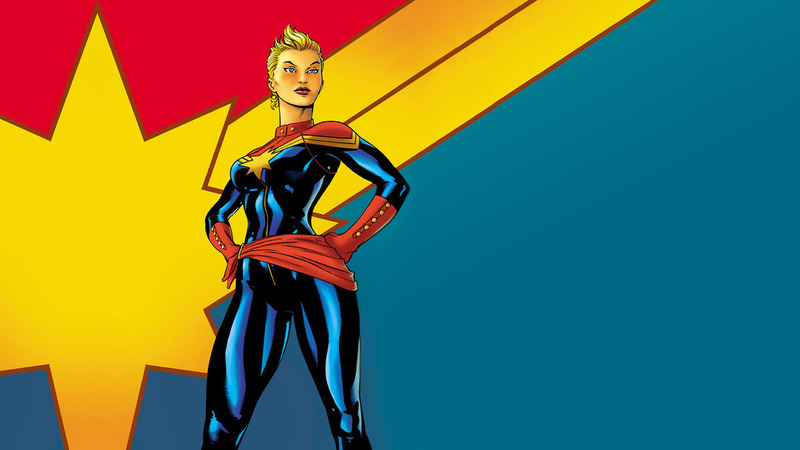 Suggestions are that the Captain Marvel we are going to see will be the seventh incarnation of the character, Carol Danvers. First introduced as a US Air Force Security Chief, she gained super powers when her genes were fused with those of the Kree. She then became Ms. Marvel. More recently she took the title Captain Marvel. It is unlikely that Marvel will undertake such a convoluted origin story in the last twelve months of phase three suggesting she will join as an established character. Or more likely there will be a simplified origin that will take place in other films before she gets her own movie. Given the alien part of the story she could easily fit into Guardians of the Galaxy 2 (2017) or Thor: Ragnarok (2017). As an affiliate of US Air Force and S.H.I.E.L.D. she could fit into an Avengers story but it is unlikely that she will be in Age of Ultron unless they have kept it very quiet but may be Avengers: Infinity War Part 1 (2018). 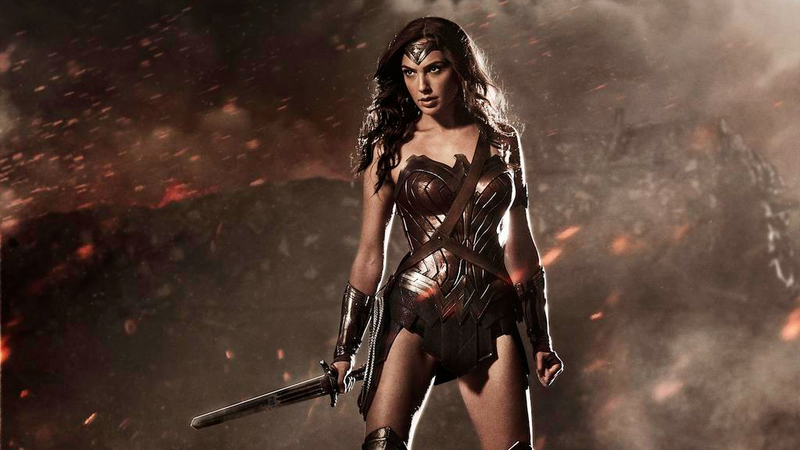 The weight on the film is immense, not only does it need to succeed to prove Marvel can handle a female character, but it must also outdo Wonder Woman. The DC movie has a twelve month head start and a more recognisable character. This conversely could work in Marvels favour, it gives a slight release of pressure, in the same way that Guardians of the Galaxy had low expectations. Casting and direction are essential to make it work, there is no word on either yet, this doesn’t stop fan speculation or expectation. I don’t know anything about the character so would struggle to suggest who should play her, however as always I would like to see someone interesting and talented. The three names that spring to mind are: Emily Blunt, Jessica Chastain and Brit Marling. We will find out 2018. The Equelizer: Denzel Washington reteams with director Antoine Fuqua to in a film based on the Edward Woodward 80’s TV show. They won’t trouble the Oscars this time around but the film is good pulpy fun. It feels like the start of a franchise, the reasonable box-office performance means it probably is. 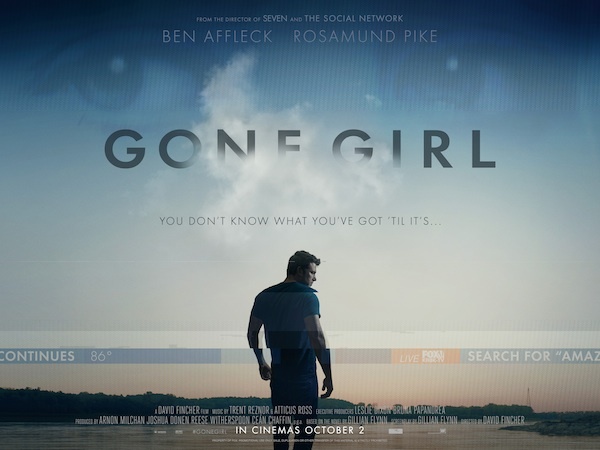 Gone Girl: David Fincher’s movie based on Gillian Flynn’s bestselling novel. 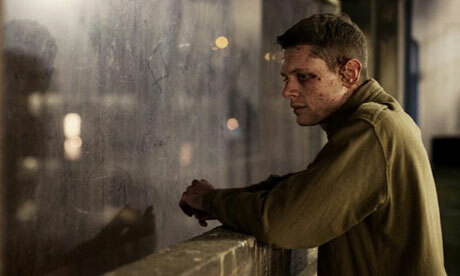 Joyfully bonkers dark and twisted and as enthralling as you would expect from Fincher. Expect an Oscar nomination foir Rosamund Pike. Dracula Untold: An unnecessary origin story of Dracula. It looks good and has some well good set pieces but does nothing new. Parts of the story make me think the writers have seen lots of Dracula movies (particularly Francis Ford Coppola’s) but haven’t read Bram Stoker novel. The Imitation Game: The true story Alan Turing, the farther of computing and the man most responsible for cracking Naval Enigma during World War II. It suffers from a lack of focus, not knowing if it wants to be a biography of Turing or a story of the cracking of Enigma. 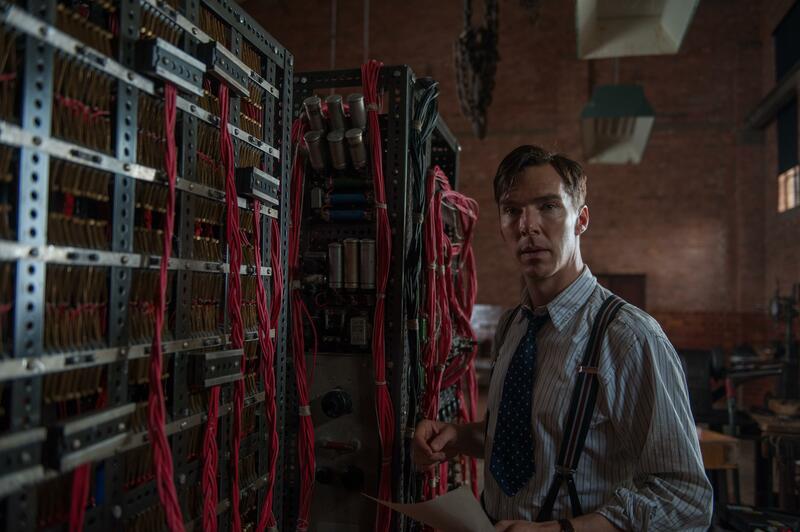 Benedict Cumberbatc’s performance is monumental and is well deserving of an Oscar nomination. 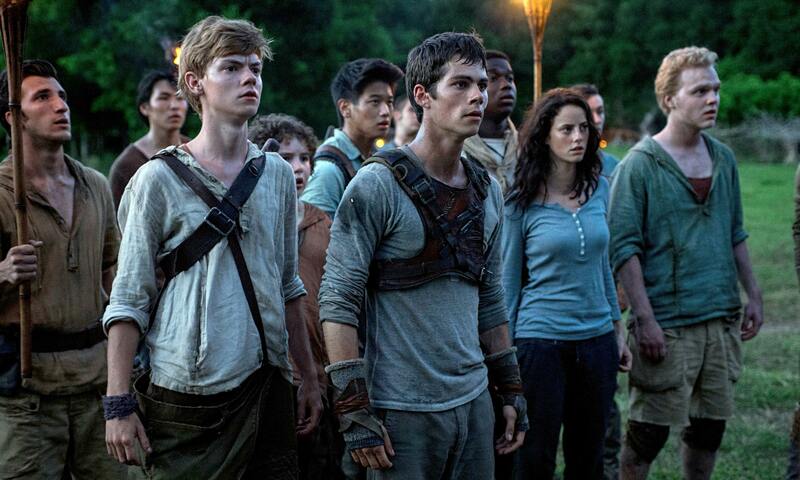 The Maze Runner: The latest in a long line in dystopian movie based on YA novels. It isn’t The Hunger Games but is still worth a look. Will Poulter is on great form but Kaya Scodelario is underused. Part two is in pre production and will be out next year. ’71: A young British soldier gets separated from his regiment and as to negotiate the perils of Belfast at the height of the troubles in 1971. Jack O’Connell again shows why he is one of the most interesting young actors working today. I have heard it compared to John Carpenter’s Assault on Precinct 13 but it really has more in common with Walter Hill’s The Warriors. 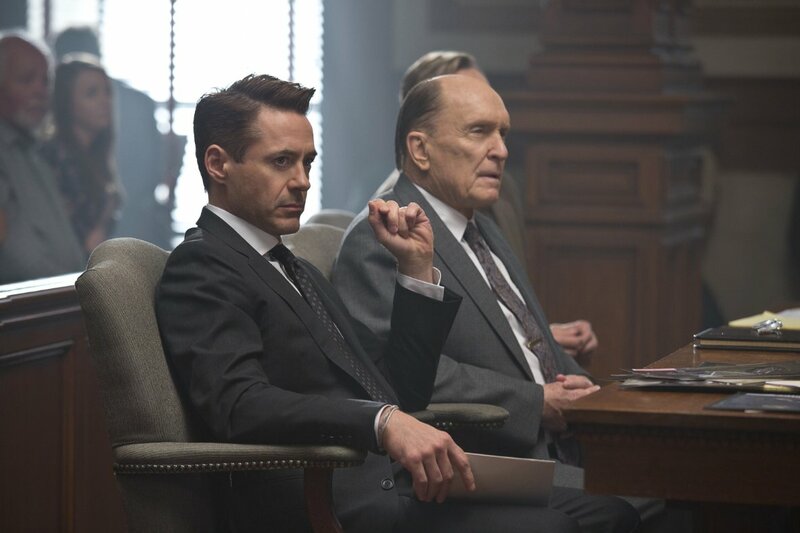 The Judge: Family drama or crime thriller? I don’t know, and the film suffers because the filmmakers didn’t seem to know either. It remains watchable thanks to a great cast headed by Robert Downey Jr. and Robert Duvall. Billy Bob Thornton makes the most of a small part but Vera Farmiga isn’t given much to work with. The Babadook: A dark psychological drama dressed up as a supernatural horror. At its heart it is a story about despair and depression but to its credit leaves enough ambiguity for audiences to decide it that is the story or the subtext. A lot of the success of the film is an intense performance from Essie Davis. Annabelle: A sort of prequel to last years The Conjuring. It offers nothing different from the numerous similar films that have been made in recent years but does have some effective scenes, the 70’s setting is well constructed and looks great. Nightcrawler: Louis Bloom is a socially awkward, possibly sociopathic man, he falls into a career as a freelance cameraman selling footage of car crashes and murders to the TV networks. Imagine Travis Bickle in Michael Mann’s LA and you will have an idea of and you will get a good idea of Nightcrawler. Jake Gyllenhaal is at his creepy best and almost unrecognisable. It is fantastic to see Rene Russo get her first decent part in years. 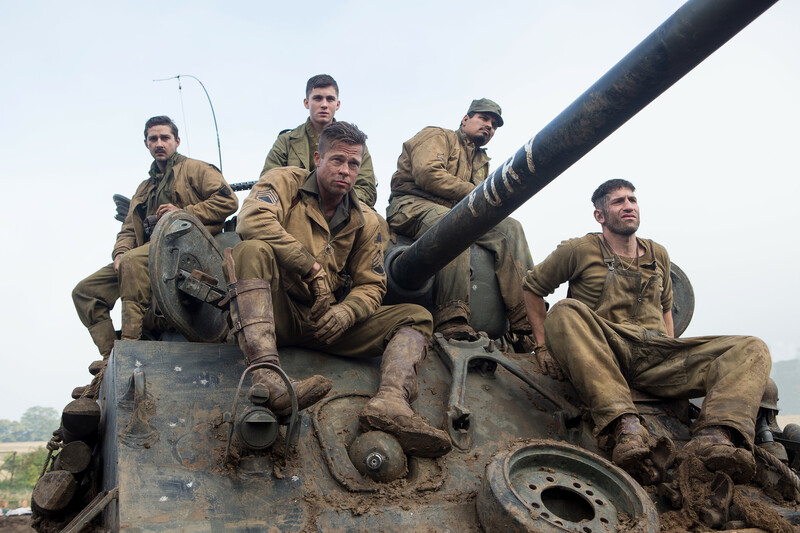 Fury: War films changed in 1998 with the release of Saving Private Ryan, Fury’s is a descendant of this new direction. Set during the final month of war in Europe in 1945 and telling the story of a tank crew. The film is at its best with the graphic, brutal and visceral war scenes than in the quieter more philosophical moments. Serena: North Carolina, during the depression. The owner of a timber empire (Bradley Cooper) seems to be complete when he meets and marries Serena (Jennifer Lawrence) but things gradually begin to spiral out of control. Well acted and stunning looking but the story is hampered by a lack of direction and focus, it plods along to an unsurprising conclusion. This month it is a near impossible choice, The Babadook and Nightcrawler are probably the best films, but Gone Girl is the movie of the month simply because it’s the one I most want to see again.